If you get a blank page (white screen of death) when you try to edit with Elementor, it might be due to a lack of memory or to another fatal error. In this case, check if you meet the system requirements for Elementor. If the problem is a memory issue, you can deactivate a few plugins and see if it solves the issue. If this was the root of the problem, contact your hosting company and ask them to increase your WP memory by using the following guide: https://codex.wordpress.org/Editing_wp-config.php#Increasing_memory_allocated_to_PHP. Use the option switch front-end editor loader method. 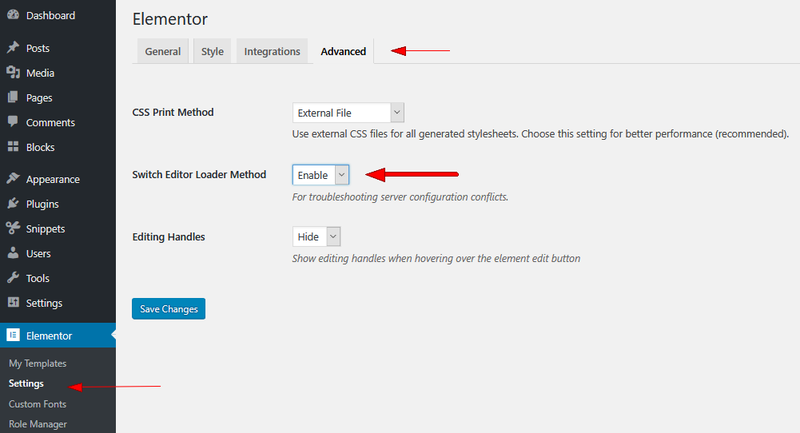 You can find it in the settings of Elementor in your WordPress Dashboard (see the screenshot below). Enable this option and check if it solved the issue. Sometimes, if your URL in the back-end is different than the one in the front-end it can also lead to this problem. Make sure that the site URL is similar to the Home URL to avoid loading issues: https://codex.wordpress.org/Giving_WordPress_Its_Own_Directory. These URLs can be checked in "Settings > General". On some servers, you will have to change the SubstituteMaxLineLength. This problem can also be due to a plugin conflict. In rare cases, the white screen of death can occur because of a program installed on your computer. To rule out this possibility, edit from another computer. Finally, this can happen because of a Fatal error. To confirm this, you can ask your hosting company to send you the PHP error logs of your server to know what is the exact issue. If you get a gray page when you try to edit with Elementor, it is probably due to a conflict with another plugin or with a script inserted within the theme. In this case, deactivate each plugin one by one, besides Elementor and Elementor Pro to figure out which one is causing the issue. We strive to solve the incompatibility issues with other plugins as much as possible. If you have noticed an incompatibility with a plugin, please report this issue to us and to the support of the conflicting plugin. Sometimes, you can get this loading page because of an add-on installed on your browser. In this case, you can switch to another browser (It has to be Safari, Chrome, Firefox or Opera). The gray page can be also due to X frame restrictions and Cross-origin issues. You can see if it is the issue by checking the error messages of your browser console (to do it, click right on your mouse, select "inspect" and then "console". Error messages are written in red). In this case, you will have to change the X-Frame-Options from DENY to SAMEORIGIN. This has to be solved by your hosting company. If you use Cloudflare, you will have to switch off Rocket Loader. When Rocket Loader is activated it can take time to load the editor of Elementor and sometimes you will get stuck on the gray loading page. Click here for a solution. The cache of Cloudflare can also prevent your browser from recognizing the new versions of Elementor and Elementor pro so make sure that you clear/deactivate your cache before updating the plugins. If you can't access the edit page and that you are sent to the live page when you click on "edit with Elementor" you are probably experiencing a plugin conflict or a memory issue. To debug this, check the troubleshooting procedures aforementioned.